What it is: Healthy, beautiful skin. A natural glow. This trio is designed to get you the look in an instant. A $93 value. 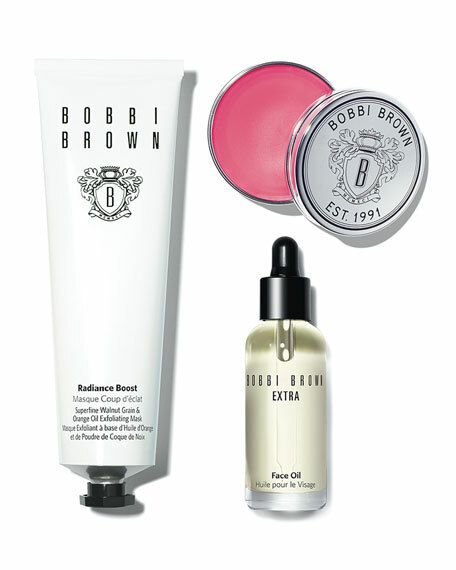 Bobbi To Go  Extra Face Oil, 10 mL/ 0.34 fl. oz. Full Size Radiance Boost Mask, 75 mL/ 2.5 fl. oz. Why it's different: Formulated with refreshing Orange Oil and superfine Walnut Grains, Bobbi's Radiance Boost Mask instantly renews skin and stimulates microcirculation. A nourishing blend of Vitamin E and botanical oils, lightweight Extra Face Oil imparts dewy radiance when tapped over cheeks, while a swipe of Raspberry Tinted Lip Balm adds moisturizing, just-bitten color to lips. How to use it: Apply Radiance Boost Mask on damp skin and leave on for 2-5 minutes. Rinse off with warm water while gently massaging skin in circular motions. Use once a week or as needed. Pat Face Oil on clean skin whenever you need an extra shot of moisture, or tap over foundation for a dewy glow. Apply Raspberry Tinted Balm to bare lips. For in-store inquiries, use sku #2119833.